I have been carving gem stones since 1970, and larger stone pieces since 2007. Whereas many rockhounds and lapidaries start out cutting cabochons, I started with gemstone carving. My first gemstone carving was created on my college desk top with tools that I converted for gemstone carving. My main point carving arbor was an electric drill held horizontally in a stand. At the time, there were very few diamond carving burrs or small grinding wheels. I made my own using sheet copper and diamond grit. The success of this first project made me excited to do another one. That first carving was a frog that I carved from a piece of a colorless quartz crystal that I had found on a geology field trip to the Snowbird Mine in western Montana for one of my classes. My next project wasn’t started for a couple of years, due to the requirements of geology graduate school. This next project was done in jade that I found near Darrington, Washington. This was a salamander on a log that I carved out of a piece of vulcan jade. I’ve continued to carve gemstones and in recent years moved up from small projects to also doing large stone sculptures in jade, granite, basalt and other stones and gem materials. In the last few years, I've mostly been carving jade that I find in Washington. Here are a few photos of some of my sculptures and carvings. 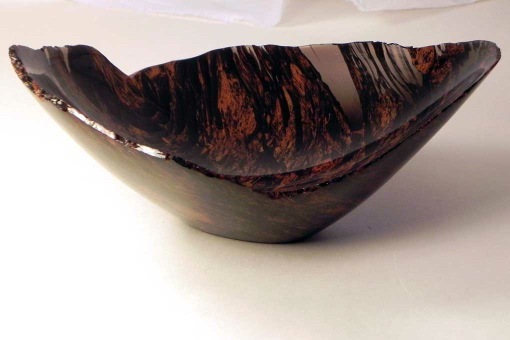 Bowl, Mahogany Obsidian, Glass Butte, OR, 11 inches, gift for friends. Bowl, Vulcan jade with blue interior, Bear Creek, Skagit County, Washington. 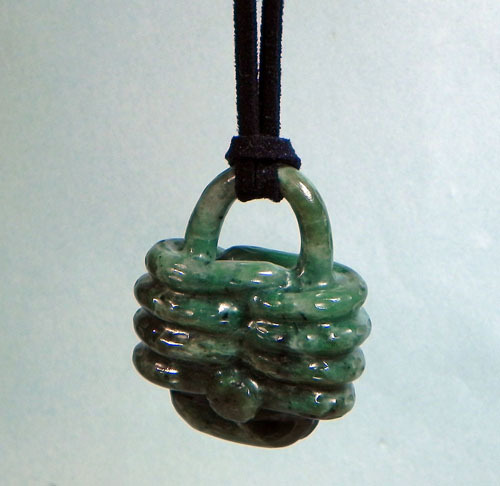 Jade padlock knot pendant, jade from near Darrington, Washington. 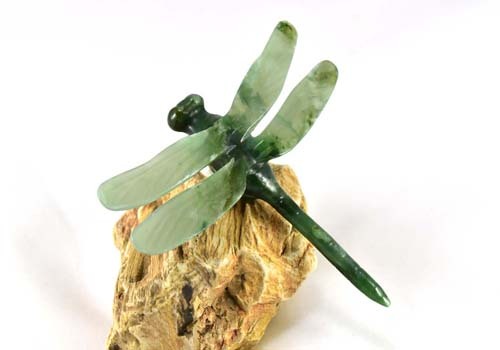 Dragonfly, jade from near Darrington, Washington, on petrified wood. I carved my first gem material in 1970-1971. This was a frog that I carved from a piece of a quartz crystal that I had found at the Snowbird Mine in Western Montana. At the time, I hadn’t done much lapidary work, only a couple crude cabochons on my father’s equipment. I was in college at the time, working on a Masters degree in Geology. I made this first carving on my desk using an electric drill mounted on it’s side as the arbor. There were very few diamond tools available at that time in small sizes and I wanted to use diamonds; it just made more sense than silicon carbide to carve hard gem materials. For grinding wheels, I did use a couple of small diameter carborundum wheels. Fortunately, someone had told my father that diamond tools could be made by using copper, cutting notches in it and forcing diamond grit into the notches. That solved my problem. I bought a couple small pieces of copper sheet ⅛ to ¼ inch thick and cut out some wheels and points of different sizes. These were mounted on small steel shafts. They worked quite well. For sanding and polishing, I turned to silicon carbide wheels and points and aluminum oxide sand paper. I also made small points and sanding burs by combining silicon carbide grit with epoxy and shaping it into balls, rods, etc. Next, after college, I carved a few fish out of agates and aquamarine, but they weren’t really much more than fancy cabochons. In 1974, I lived in the Mount Vernon, WA area for a couple of years and took the opportunity to go jade hunting. 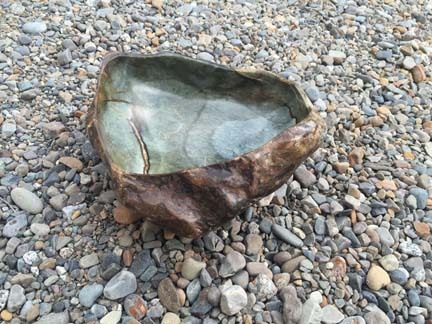 One day I found a hand size vulcan jade cobble in a gravel road. Because of the shape of it, I could visualize a salamander on a log, so that was the start of my jade carving.